One of the first things you notice in rural Spain is the number of fallen oranges and lemons splattered on the roads, squashed by vehicles. Spain is the leading exporter of citrus fruits to the world. Andalucia exports only 8% of the total Spanish market, whilst Valencia exports 81%. Most of the fallen oranges around here are not grown on commercial farms, but in and around the grounds of small fincas, casas and casitas. They combine with lemons, pomegranates, almonds, olives, custard apples and the ubiquitous fig. The shape of the trees characterise the landscape. That, and the mountains. 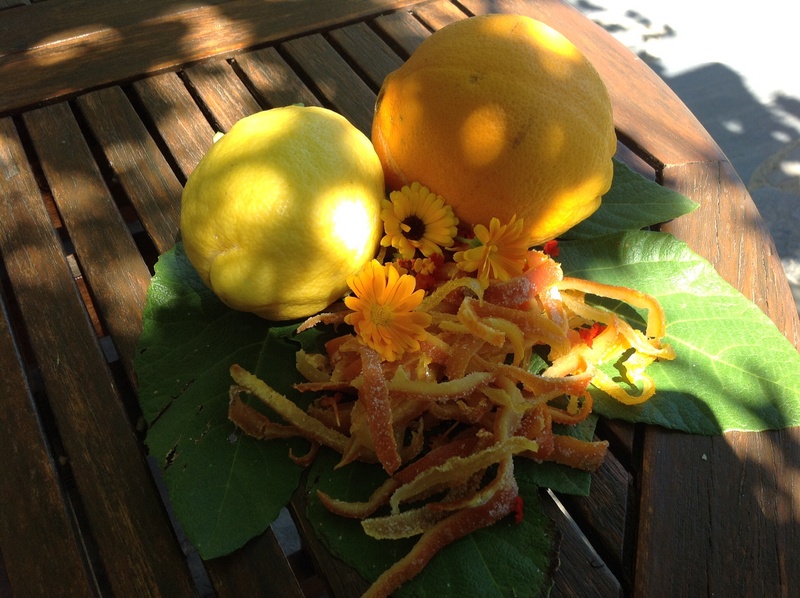 As an English woman in love with Spain, the citrus fruit entrances me. Walking out into the garden and reaching up to pick a fruit that is twice as big as my hand, with thick skin and warm fragrant flesh and to peel its thick skin and dive into the juicy innards is a simple yet memorable pleasure. One to be drawn on in the dark winter months. This visit I have made litres of lemonade. 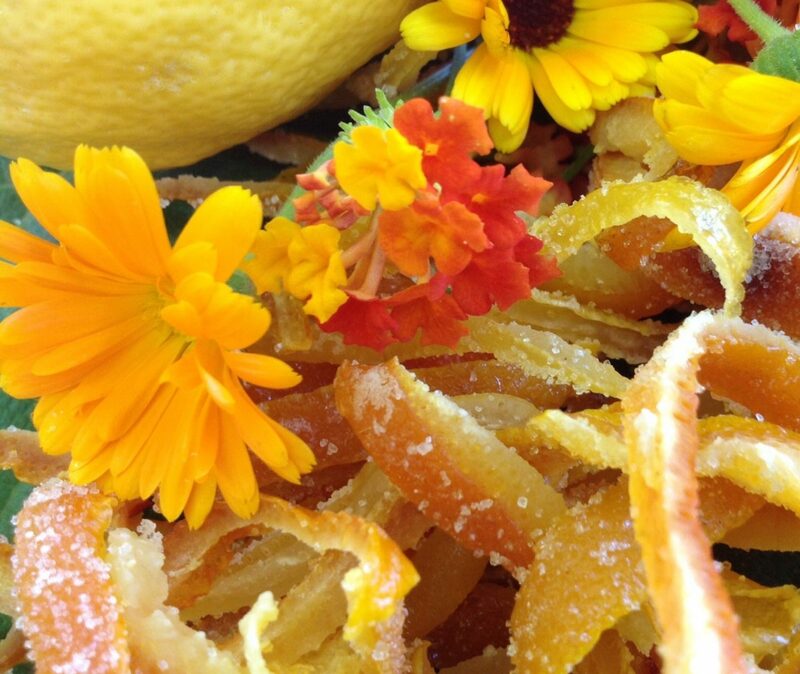 And loads of candied citrus peel. The oils in the flesh are so pungent that eating just one candied stick is sufficient to leave the flavour lingering in the mouth for half a day. If you are in the UK, try and buy thick skinned fruit. Nothing will match the fruit picked from the tree, however! 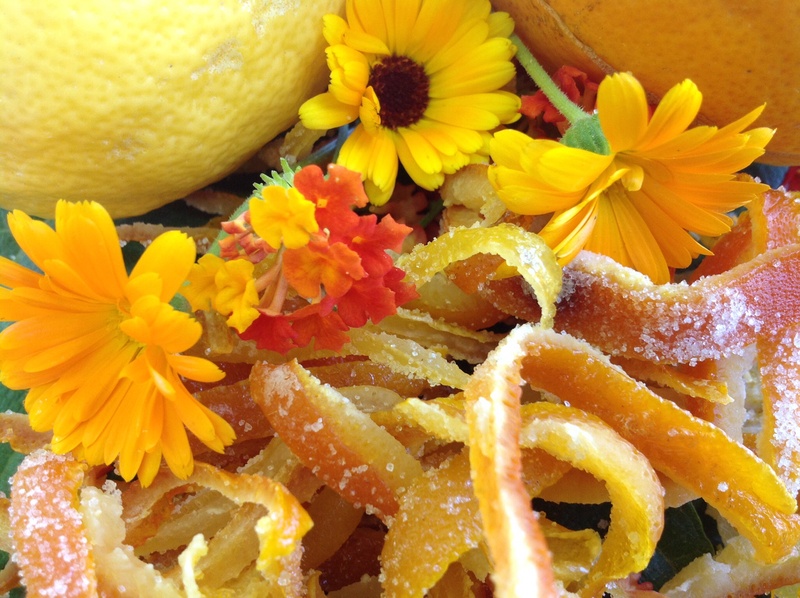 Peel the skin of your oranges and lemons with a sharp knife, leaving some of the pith on the back of the peel. 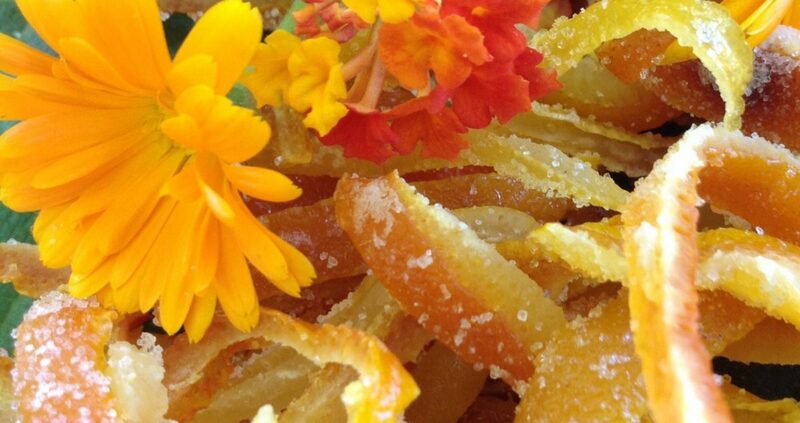 If you prefer your candied peel more crispy, don’t include as much pith. Peel downwards, not around and then slice the peel lengthways. Make a syrup from 750ml water and 200g sugar then add all the peel you have. Simmer for about 15 minutes until the peel is soft. Remove the poached peel from the syrup and lay out to drain on a cake rack placed over a baking tray. Leave somewhere cool and airy (over here that is impossible, so I turned on the floor-standing fan and placed it near them). When they are dry to the touch, coat with caster sugar and then put in an oven set to 50C and leave them in there for about 8 hours. By then they should be crisp and stiff. If not, leave in for longer. Store in an airtight tin. Coat the ends in chocolate if you like. Gorgeous with a strong coffee. Share with a friend if you must. Impossible to resist if you are in the house on your own! 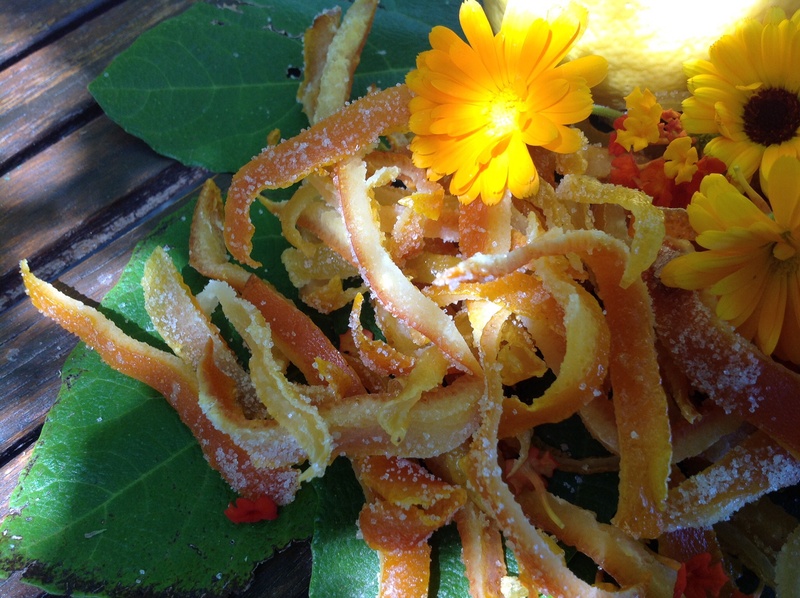 And don’t discard the syrup – poach orange slices in it and eat with thick yogurt for breakfast. or use as a base for lemon/orangeade, or soak an almond and orange cake with it. Or add to brandy and zoozh up with soda… The possibilities are endless. If you are making this in Spain you will know for sure, that clearing up after you is essential. Last night after a little too much San Miguel I failed to do so. Consequently, bleary eyed and in need to coffee, my first task was to massacre all the ants in Christendom this morning that were lapping up spilled syrup on the floor. Bad, bad Karma. Thanks Sue. It has been a joy to have enough time to write. And who would not be inspired, living here.